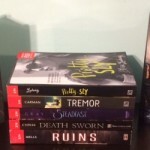 I started blogging November 26, 2011 after being a member of GoodReads for a few months. I just wanted my own space on the internet to share my thoughts on books. I had read a few blogs at the time, and it looked like something fun to do. I play The Sims 2 and The Sims 3, kind of obsessively. My favorite part is connecting with other readers. I’m super antisocial in “real life” and don’t talk much, so it’s nice to get comments on my reviews and knowing someone out there is interested in what I have to say. I’m not sure about my least favorite part. Maybe deciding what to read next; there’s too many books and too little time! Pinkindle is actually the name of my Kindle. 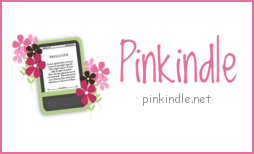 I have the habit of naming my electronics “Pinky” (my iPod is Pinky 4.0 and my iPhone is Pinky 5) so I just combined Pink and Kindle to get Pinkindle. There’s so many amazing bloggers out there, but I don’t really get inspired by others. I don’t like to compare my blog’s success to others, because I may get disappointed that I’m not doing as well. I just want to do my own thing. I mostly just look for bloggers who have similar tastes in books as me, and I do judge a bit by their design. If I don’t like how the blog looks I probably won’t come back. My biggest pet peeve is not being able to easily locate where to leave a comment! I’ve run across a few blogs that I wanted to comment on and could not find a link or comment box anywhere. Sleeping Naked is Green by Vanessa Farquharson, The Host by Stephanie Meyer, Georgina Kincaid series by Richelle Mead. An annoying main character! If I can’t stand the narrator, how am I suppose to care about the story? The cover. Yes I judge books by their cover, but I’ll read the blurb next to make sure it’s something I may actually like. I don’t wear pants, except pajamas. I don’t even own a pair of jeans. Seriously. Nope. I’m currently searching for one. It’s hard! I wanted to work for the World Wildlife Fund, and that mostly hasn’t changed. It’s my dream job, but I don’t want to move. Dogs! I’m allergic to cats. Ew, neither! I’m a Cherry 7up and Cranberry Splash Sierra Mist girl. But I seriously live on jeans I don’t know how you can survive! Fantastic interview guys!